Roma Park, Lusaka’s first mixed-use community, is welcoming major businesses MTN, China Civil Engineering Construction Corporation (CCECC) and Madison Capital to its industrial park, further cementing Roma Park’s position as Zambia’s premier business and residential address. In Roma Park businesses enjoy 0% import duty on equipment thanks to the development’s partnership with the Zambian Development Agency (ZDA). MTN’s new head office will take up 4,500sqm, CCECC’s head office for Zambia will be completed in April, and Madison Capital will lease 2,200sqm of A-grade warehouse and 3,100sqm of office space in the park. Link Pharmacy and Unik Construction are also present within the development, occupying a distribution warehouse and commercial premises, respectively. 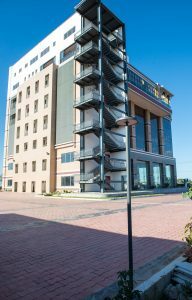 The centrally located Roma Park has been a starting point for many investors into Zambia, either through its residential or commercial properties. Roma Park commercial property prices have increased 150% between 2011 and 2017. The project’s residential property prices have seen a stellar 280% growth over the same period with 98% now sold out. The development’s 10km of tarmac roads, fibre optic connectivity and access to water and electricity has solidified Roma Park as the premier residential and business address in Zambia. “The success of Roma Park is replicated across all our projects in Sub-Saharan Africa: secure land title, high-quality master planning and world-class infrastructure,” said Tim Beighton from Rendeavour.